> Is there a general motivation centre in the depths of the brain? Is there a general motivation centre in the depths of the brain? A team coordinated by Mathias Pessiglione, Inserm researcher at the “Centre de recherche en neurosciences de la Pitié Salpêtrière” (Inserm/UPMC-Université Pierre and Marie Curie/CNRS) have identified the part of the brain driving motivation during actions that combine physical and mental effort: the ventral striatum. The results of their study were published in PLoS Biology on 21 February 2012. The results of an activity (physical or mental) partly depend on the efforts devoted to it, which may be incentive-motivated. For example, a sportsperson is likely to train with “increased intensity” if the result will bring social prestige or financial gain. The same can be said for students who study for their exams with the objective of succeeding in their professional career. What happens when physical and mental efforts are required to reach an objective? Mathias Pessiglione and his team from Inserm unit 975 “Centre de recherche en neurosciences de la Pitié-Salpêtrière” examined whether mental and physical efforts are driven by a motivation ‘centre’ or whether they are conducted by different parts of the brain. The researchers studied the neural mechanisms resulting from activities that combine both action and cognition. To this end, a series of 360 tests, combining mental and physical effort, were performed whilst being monitored by a scanner. The 20 voluntary participants were placed in the supine position, with their heads in a functional MRI scanner. They then had to complete a series of tasks through which they could accumulate winnings. However, in each series the winnings were limited to the first incorrect response. The tasks combined cognitive and motor actions. The participants had to find the highest number from among different-sized numbers and then select it by squeezing a handle located by their left or right hand (depending on the number’s location). At the end of the test, a winnings summary was displayed to motivate the participant. 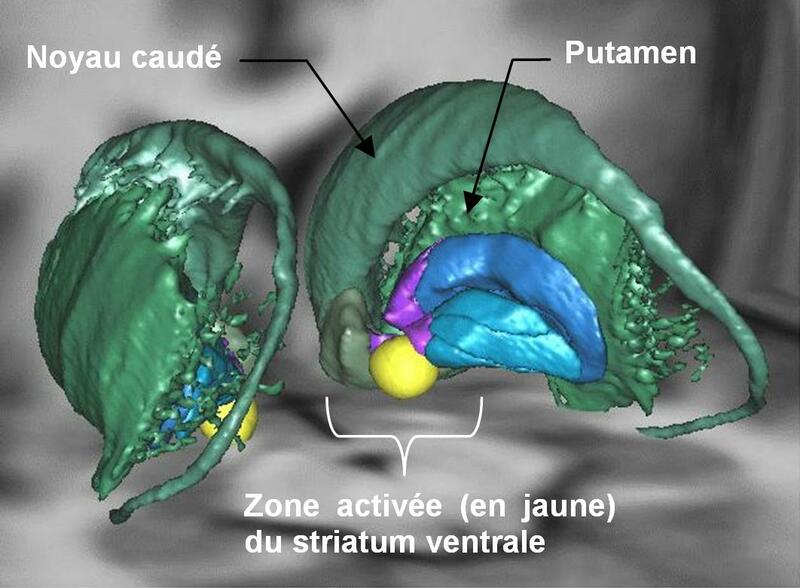 3D representation of motivational system (striatum ventral) activated during physical or mental effort. 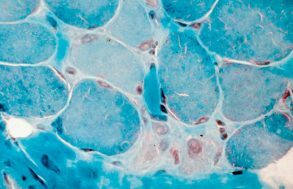 Using images obtained from the MRI scans taken during the test, Mathias Pessiglione and his team identified a general motivational system in the depths of the brain, i.e. a structure capable of activating any effort type, both mental (concentrating on the task in hand) or physical (lifting a load). The researchers observed that the ventral striatum was activated in proportion to the amount of money involved: the higher the degree of motivation, the higher the activation level. Furthermore, the ventral striatum is connected to the median part of the striatum (the caudate nucleus) when the task to be performed is cognitively difficult (when the physical size and the numerical value of the numbers did not correspond). This ventral region solicits the lateral part of the striatum (the putamen) when the difficulty is motor-related (when the handle had to be squeezed very tightly). The researchers suggest that the expectation of a reward is encoded in the ventral striatum, which can then drive either the motor or cognitive part of the striatum, depending on the task, in order to boost performance. “The ventral striatum may commute connections in accordance with the request, i.e. enhance the neuronal activity in the caudate nucleus for a cognitive operation and in the putamen for a physical action” explains Mathias Pessiglione.